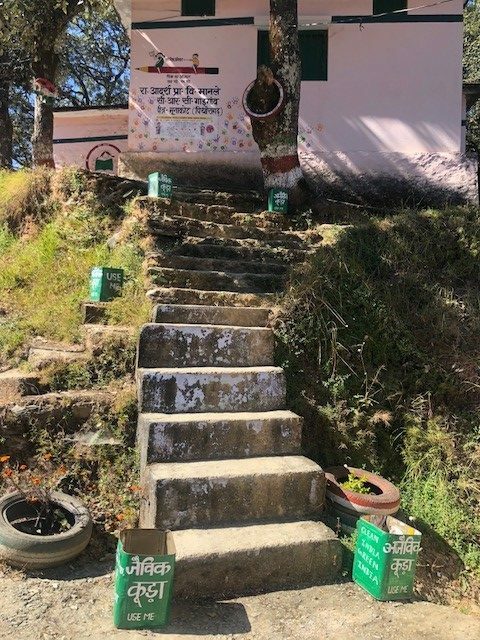 For the students of the Government Model Primary School (GMPS), Moonakot Block, Pithoragarh, the journey to school every day involves charting their path through the rocky, mountainous terrain, with ever-shifting shadows as a golden sun tirelessly plays peekaboo through the clouds. The school primarily caters to three villages that are close by, however, some students from other neighbouring villages which though have their own primary schools, also study here. These children live with their grandparents who have moved near this school for the sake of their schooling. Reiterating the sense of community at the school, assistant teacher, Chandra Shekhar Sharma expressed that a school is a place of inclusion irrespective of one’s caste and religion. The school has students from well-to-do, elite families, as well as, families of government employees, army parents and those living below the poverty line. Shekhar Sharma believes that the attitude of equality (of considering each child as a ‘child of god’) adopted by the teachers has been internalized by the students too, and has helped blur the lens of caste in people’s minds. From the road below, one cannot see the school; as one walks up the hill on the road flanked by bushes on either side, the little pink building of the school reveals itself. While some walls of the school are painted with slogans, such as ‘Things do not change, we change them,’ and ‘आत्म विश्वास सफलता की प्रथम सीढ़ी है’ (Self-confidence is the first step towards success) others are filled with tiny handprints of the school students. The building has three classrooms—one room for the nursery; one for classes II and III, and one for classes IV and V.
Around eight students come to the front of the morning assembly to, one by one, narrate a line of ‘local news’, which comprised the latest news from their own homes! • Monthly ‘Do-whatever-you-want Friday’ are Fridays when the students construct their day with activities that they wish to do. Shekhar Sharma believes that giving this agency to the students helps them become more invested in their own education and also keeps their interests alive. Shekhar Sharma, assistant teacher, is also the coordinator for the mid-day meals and cleanliness programs in the school. He has been working in this school since 2006 and has previously, held the post of a science teacher and Principal in other schools. He lives with his parents and brother’s family and his younger brother owns a private school which employs three of his family members. While in the past, Shekhar Sharma has worked in various job ranging from being a contractor, money lender, to doing small projects with NGOs; he has also spent some time managing the school run by his family. This perhaps was the foundation of both his passion and skills required for running a school. This experience, combined with his father’s persistence to do a degree in education, (he completed his Bachelors in Physical Education, BPEd, in 2006) has got him to this position. Once placed in the school, Shekhar Sharma realized that there would be no looking back; this was what he wanted to do. This motivated him to compete his M.A in Education (through correspondence) and the Special BTC (Basic Teaching Certificate) offered by the education department. Shekhar Sharma has a strong yet amicable personality combined with great people skills, which have enabled him to not only form good relations with the community but to also network with other organizations and NGOs. ‘इस विद्यालय के लिए मैं किसी के सामने हाथ फ़ैलाने से डरता नहीं हूँ, चाहे वो मेरे दोस्त हो, या NGO क्षेत्र से हो, हर तरह इस विद्यालय के लिए मैं मदद मांगता हूँ (I do not hesitate to ask for help from anyone when it comes to this school; be it my friends or other NGOs, for this school I am willing to get help in whatever way possible). On being asked about his ‘people’ skills, he expressed that right from when he can remember, he has had a zeal within him, irrespective of the activity he chose, to be a leader, an influencer. He has a passion for doing something unique and impactful. Shekhar Sharma believes in taking people along with him. His nature and actions have always attracted people towards him, a skill he is grateful for. He expresses that he derives happiness from doing things for the community. It is perhaps this which has enabled him to form such strong bonds with the community. He also gains his inner energy through meditation and is an active member of Shri Ram Chandra Mission. His experience of running the family private school, working in jobs that built his networking skills and having a very supportive family have contributed in enabling him to build constructive participation of the community; and, network with civil society organizations and local government representatives for school management. When he joined this school, it did not have a good reputation; the enrolment was very low and people seemed to certain preconceptions about the school. Shekhar Sharma prioritized the understanding of the community’s needs. Along with the school work, he also helped the community members with their other work—getting documents for filing BPO (Below Poverty Line) cards, clicking and printing passport-size pictures for them and so on. These little things added to the goodwill and increased trust of the community members towards him. He noted the grievances of people against the school while doing these tasks. His action this feedback and treatment of the community members as stakeholders in the school played a major role in creating a positive perception about him in the eyes of the community. Shekhar Sharma prioritized certain actions, which according to him, would be visible to the community and hence, increase trust and enrolment. He believed once this was done, it would be easier to make changes in pedagogy and other practices. By doing this, the student population gradually rose from 16 to 53. • Adopting appealing features of public schools: According to Shekhar Sharma’s understanding, while talking to members of the community, there were certain features of public schools that appealed to people. He adopted these into GMPS. They changed the school uniform to include a tie, thereby making the students look smarter; started calling mid-day meals, ‘lunch’; and, focused on the teaching of English. • Success in competitive exams: The teachers started training the students for different competitive exams. After two students got selected to the Navodaya schools, all students of one of the public schools shifted to GMPS causing it to shut in 2011. Subsequently, one other public school also shut down in 2016. • Increased visibility of students: Students’ participation in sports, maths and general knowledge competitions at the district and state levels built the student’s confidence and communication abilities. 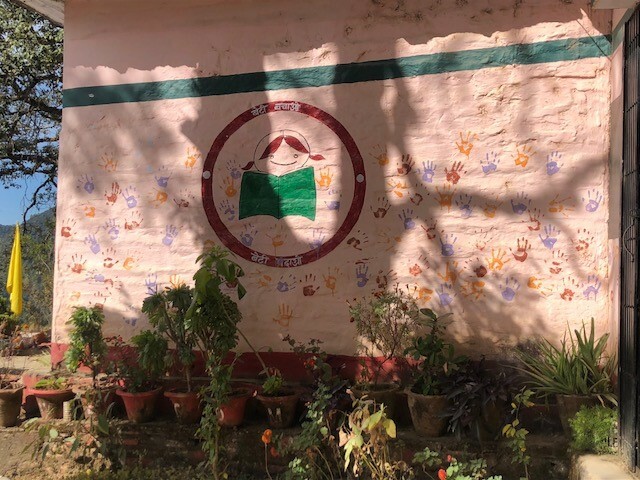 When students interact outside the school, according to Shekhar Sharma, they are noticed by others in the community, and the school also benefits. • Cleanliness: The school actively encouraged cleanliness and hygiene of self and surroundings. This has been implemented aggressively in the school by encouraging the use of dustbins and incentives, like awards for the student of the day (most smartly dressed child), the cleanest student of the year, and highest attendance. • Building a community: When students witness all that is being done for them, they too feel invested in the welfare of the school. For example, when a school meeting is called, students insist that their parents attend. They too want their parents to become a part of the school system. ‘यदि बच्चे को विद्यालय में अच्छा माहौल मिलेगा, उसको भय नहीं रहेगा, तो वह स्कूल आने के लिए खुश रहेगा. हम बच्चों से कहते है की अगर तुम्हारा होमवर्क नहीं हुआ है या लर्न नहीं किया, कोई बात नहीं, तुम फिर भी स्कूल ाओ, कोई नहीं डाँटेगा.’ (If students get a good environment in the school, if they are not afraid, then they will be happy to come to school. Hence, we tell the students that even if they haven’t completed homework or haven’t learnt the given portion, they must still come to school and they will not be scolded.) Shekhar Sharma believes that one should not teach by inducing fear. A safe space is required for learning and encouragement helps in building students’ self-esteem and confidence. Furthermore, he believes that students learn by observing and hence, the teacher should be a role model. Some good practices seen in the school were centred around the child’s capability and pace. For example, each class had an Excel sheet with the names of students and skills to learn during that semester. Since, the time taken by different students to understand topics varies, the classroom allowed for them to spend time on each topic according to their need. The student progressed from one tick to two ticks and then three ticks when the skill was mastered. Hence, what the child did in class on a day depended partly on his/her chart. • Average of 90% attendance for all students. • Three times ‘Best School in the District’ award. • Shekhar Sharma received the Rajya Pal award for ‘Best Teacher’ in 2017. • Twice the ‘Best School Committee’ award. • More than 15 students admitted to Jawahar, Navodaya, and Him Jyoti schools. • Shekhar Sharma’s networking has enabled connections with different organizations and NGOs. Goonj supports 11 of their children for school supplies, technical support, books, shoes, bags and they also visit to conduct creative activities and give guidance. Goonj also facilitated an opportunity for five students to visit Delhi and interact with students from various other parts of the country as part of a cultural exchange program. ‘एक शिक्षक को समाज का दर्पण बने रहना सबसे बड़ी चुनौती है’ (The biggest challenge for a teacher is to continue being a mirror of society.) Shekhar Sharma expressed that his biggest obstacle was that most people perceived him as a newbie who was energetic and wanted to execute grand plans; but they all bet that after some time, he too would resign into being mediocre. They used the expression, ‘नया मुर्गा प्यासा आता है’ (a new employee always arrives thirsty). The community’s view about government schools was also adverse. It believed that students only go to school for the mid-day meal and cannot learn to speak in English. A stark difference is seen between students whose parents spent time talking with them and took an interest in their school activities as opposed to students whose parents are too busy working. The former were much ahead of the latter. Some children stay quite far and the route is a treacherous two-kilometre steep climb; hence, some younger children depend on the older children from the inter-college to make the journey. Finally, a persistent challenge is the constant effort to maintain his position as a representative of his society and hold on to its trust and belief. • Strategies adopted to involve the community as the active stakeholder in the school is impressive. Shekhar Sharma has managed to build confidence and a sense of responsibility towards the school among the parents through continued dialogue, a grievance cell, visible action and serving as an anchor point in the school who people trust. - Some students are picked up in the teacher’s van coming from Pithoragarh city to the school since they are unable to travel on their own. - Students who can’t afford the school uniform, books or other school supplies are provided with these by a supporting organization. - The differential pace of learning provides students space to learn at a slower or faster pace, reducing the number of those dropping out due to boredom or disinterest. • Motivation of teachers: Shekhar Sharma believes that for some people, the passion and motivation to do something for the community and take action to create a change, comes naturally. But for the rest, motivation can be fuelled by dynamic leadership. Many times, when teachers see desirable results from action taken, they get motivated to act too. He believes that teachers are also learners and a continued willingness to learn by observing and reviewing is useful. There should be no shame in learning from other teachers and schools. The school had invited four parents, all males, of students from class II, IV and V. One of the parent’s daughter had passed out from school and got admission to the Navodaya Vidyalaya, while his son was studying in class V. The parents narrated their experiences of the PTM that is held once a month. The meeting begins with important announcements by the school and hearing/addressing of grievances of the parents and later moves on to being a community get together. All of them eat and socialize and this time spent together reinforces their feeling of the school being one big family. • The motivation level of the teachers makes them feel that genuine effort is being put into their child’s education and hence, encourages them to match it with the same level of involvement. • The school has a joyous atmosphere (ख़ुशी का माहोल) which can uplift anyone’s spirits. Two parents mentioned that many parents often visited the school when they were having a tough day just to lighten up their mood. Hence, the school served a purpose in the lives of the parents too, beyond being a place of their child’s education. • Tangible and visible outcomes achieved by the school reinforce their trust in the school; opportunities that the students get, values of discipline, cleanliness and confidence that the students showcase. All parents mentioned that if one sees a group of children in the market, one can very easily pick out which ones go to GMPS because these children stand apart (उनकी बात ही अलग है). It seemed like the school provided a platform to the parents to talk about not only their children but also about themselves. It gave them space for expression and exchange and hence, instead of viewing parent meetings as ‘work’ they saw it as a ‘social evening’. All of them compared the school to ‘home’ in different capacities; some said the school is like an extension of their homes where they can express themselves without inhibitions, while some termed the warmth and welcome, they received at school as homely. एकदम घर जैसा लगता है, अपनापन है’ (Feels like home, there is comfort.) ‘हम खुल के प्रॉब्लम बता सकते है’ (We can express our problems openly). There seem to be different routes via which a school achieves ‘success’ and the indicators of this ‘success’ can be different for different schools. For some schools, a dynamic teacher using innovative pedagogy becomes an anchor, while in some others, a teacher’s ability to inspire and motivate students serves as a driving force. In the case of GMPS, what stands out is the complete involvement of the community and the voice and agency given to the parents in their child’s education. Though one must practice caution in measuring success only by parameters like the number of admissions into Navodaya, it may also be important to perceive its value and function in the given community. Shekhar Sharma’s dynamic leadership is indeed commendable; he has clearly played a pivotal role in transforming this school and has gained the awe and admiration of those around him. Keeping in mind sustainability, there may be value in exploring how the goodwill of a school can often be attached to a single person and how that grows to become representative of the entire school. Acknowledgements: I would like to thank Mr Chandra Shekhar Sharma for taking time out and sharing his experience and reflections with us elaborately and freely. My heartfelt gratitude also to the parents who came to school and engaged in conversations about their experience with the school. Furthermore, I thank the teachers and students for allowing me into their space with such openness and warmth. Lastly, I would like to extend heartfelt thanks to my colleague, Mr Muneer C, member District Institute, Pithoragarh, Azim Premji Foundation, for his time and efforts. His inputs prior to the visit and reflections post it, provided me with a third person perspective and helped me in constructing a holistic understanding of the community.